This is my third and final (planned) post reflecting on Rob Bell’s Love Wins. Follow these links to find earlier posts for what I like and what I don’t (and more of what I don’t). 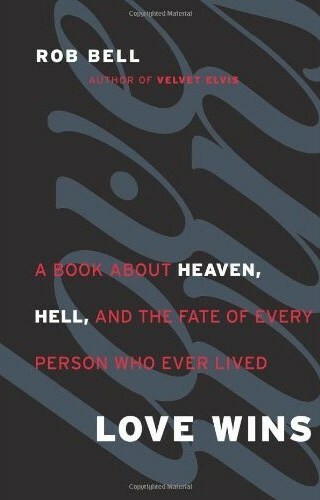 As Bell pointed out in the now infamous promo video for the book, what you believe about heaven and hell is important because it is related to what you think about God. And that is my interest in this post: what understanding of God emerges in Love Wins? Theologians use the term “theology proper” to refer to the specific branch of theology that relates to the doctrine of God. So that’s what I want to consider, some aspects of the theology proper of Love Wins. As an avenue into this discussion, I want to take a look at something Bell says in chapter 7. He raises the fact that the gospel has often been cast in terms of a rescue. God is holy. Therefore, God must condemn sinners. But Jesus takes our place so that we can have eternal life. Bell is concerned that this telling of the story subtly suggests that Jesus rescues us from God, which is a problem for him. He says, “Let’s be very clear, then: we do not need to be rescued from God. God is the one who rescues us from death, sin, and destruction. God is the rescuer” (182). Two observations are worth making in response to Bell’s argument as it relates to the doctrine of God. First, Bell rightly points out that God rescues us from death, sin, and destruction. What he fails to recall is that death is the consequence of sin because God has determined that it should be. God is the one who stipulated to Adam, “If you eat, you will die.” And when Adam ate, God implemented the curse of which the man had been warned. Death is God’s judgment against sin, and it is the judgment from which we need to be rescued. Therefore, in needing to be rescued from death, we need to be rescued from the penalty of God’s curse against sin. We need to be rescued from God. Second, Bell’s concern that we not suggest that Jesus rescues us from God is insufficiently trinitarian. It is most certainly true that Jesus rescues us from God. But we must also remember that we are trinitarians; Jesus is fully divine. So, Jesus’ rescuing of us from God is really God rescuing us from God. In Christ, God rescues us from himself by taking God’s wrath onto God’s self for our sake. It is not as if God is sending Jesus as some detached and unlucky fellow who somehow got conscripted into this rescue plan and ended up with the short end of the stick. So, inasmuch as God was in Christ reconciling us to himself, God rescues us from God. And that is love that wins. Bell has yet to grasp the trinitarian nature of the God’s work of salvation. Further, if God has indeed appointed Christ as judge of all people (Acts 10:42), and if it is the case, as Jesus says, that he determines who enters eternal life and who is condemned, then we need to take on board that Jesus actually rescues us from Jesus. Indeed, scripture even speaks of “the wrath of the Lamb” (Rev 6:16) indicating that there is no reason to think that God’s wrath against sin is not also Jesus’ wrath against sin. Father and Son do, after all, share the same divine essence. This, then, is the result of a robust trinitarian theology: Jesus saves us from Jesus’ wrath. In light of these considerations, I can only conclude that Love Wins is deficient in that it fails to take on board the soteriological implications of a deeply trinitarian understanding of God. At the end of the day, it appears Bell’s authority for developing his own theology proper is not scripture but his own personal creativity, which is too bad in that it misrepresents scripture and is highly misleading. My only conclusion can be that Bell’s theology proper simply isn’t. ← Thoughts on Love Wins (2): Is Consistency a Virtue? i firmly believe that we serve a god who is using you, rob bell, billy graham, marcus borg, n.t. wright, rick warren, bishop sprague, and many other to spread the good news. it is a big tent under which we are serving a big god. Thanks for taking time to read and for posting your thoughtful comment. Let me make a couple of points in reply. 1. Just because something is pastoral doesn't mean it gets a pass on serious theology. As one of my seminary profs says, “You've got to boil it up before you can boil it down.” I think Bell is capable of doing solid theological work but didn't in this book (see my first post reviewing his exegetical method). And any pastor who claims to be teaching what the Bible says ought to handle it accurately. 2. I should clarify why I think Bell is misleading. I don't think he is intentionally misleading anyone, but I do think he is in error. And error is misleading. It leads us away from truth. I really don't think chapter 7 has sufficiently wrestled with a distinctly trinitarian understanding of the atonement, which has led him into saying things that really just plainly contradict scripture. In Romans, it is precisely God's wrath (orge theou, 1:18 ff.) from which we need to be rescued. The revelation of God's winning love is that God takes God's own wrath on God's own self in the person of Jesus Christ. Wow! Again, thanks for reading and commenting! i really enjoyed this book. it's a pastoral book and not a book of critical theology. i think people like rob bell are doing some really good things for our faith, and i would include this book in those good things. we are all interpreting scripture, and we are all encountering god, and i hope we are all doing the former as a means to the latter. it is also my hope that we can have respect for each others' points of view when we don't interpret things the same or even believe the same things. i am a methodist, and i come down very much on the same ground that bell does on this topic (a wesleyan and a universalist? sure, and i value both mystery and consistency with a humble approach to human knowledge). as both a devout christian and a serious student of history and theology, i do not find bell's accounting in this book to be misrepresenting scripture or misleading at all, (nor are his ideas new in any sense). we just disagree as to how to interpret scripture and apparently about certain aspects of the character of god. and that's ok.
& on this topic in particular, none of us really know with factual certitude anything about what happens when we die, right? i trust in my heart, though, that it will be good (for everyone).